Visiting Geneva is like being transported into an alpine wonderland, and Hotel Le Richemond is just as fanciful and beautiful as the city around it. 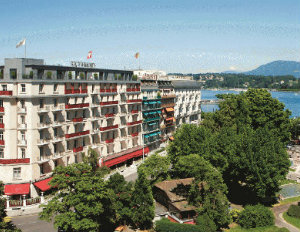 The only Dorchester property in Switzerland, Le Richemond emphasizes comfort and customer service. Le Richemond was built on the banks of Lake Geneva, close to Geneva’s landmark fountain, Jet d’Eau, north of the Swiss Alps. It opened in 1875, and it has hosted legendary, world-renowned actors, artists, and international dignitaries. Each of Le Richemond’s 109 rooms and 22 suites have marble bathrooms with rainforest showers and balconies overlooking scenic views of Lake Geneva, snow-capped mountains, Jet d’Eau Fountain, Brunswick Gardens, and more. Many of the rooms feature rare woods, bespoke fabrics, and one-of-a-kind design details, such as European mosaics. Built with families in mind, a stay at Le Richemond can elevate the basic family vacation. The concierge at Le Richemond can arrange multigenerational activities for younger guests, like tours, free local transportation to and from Geneva’s historic attractions, and chocolate watch workshops–because what’s a visit to Switzerland without an activity that involves Swiss chocolate? If you need some quality down time away from the family or just away from everyday life,Â book a treatment at Le Richemond’s Le Spa by Sisley. As French skincare experts specializing in onaromacology, the science of using fragrance to relax the mind and body, Sisley creates products that contain the finest plant extracts and essential oils. Want to workout instead? Visit Le Richemond’s fitness studio, which has the latest Technogym equipment and personal trainers for your convenience. Meals at Le Richemond are a culinary delight. The hotel’s signature restaurant, Le Jardin, is located discretely between Brunswick Gardens and Lake Geneva and concentrates on creating food known for its simplicity and authenticity. Chef Philippe Bourrel uses local fish, lamb, cheeses, and produce in his classic and seasonal dishes. Le Bar is a stylish lounge and bar that serves light meals, snacks, and bar bites alongside creative cocktails. The space has high ceilings and art deco dÃ©cor, and its menu features an extensive list of martinis, wines, and champagnes. After work on Wednesdays, from 6:30 to 11:00 p.m., DJ Guz and live musicians help patrons unwind from the day. Both Le Jardin and Le Bar host special events, like holiday themed soirees, wine events, oyster and caviar bar nights, and jazz evenings. But, if you don’t feel like going out for dinner, feel free to take advantage of Le Richemond’s 24-hour room service. Hotel Le Richemond can be the backdrop for a memorable, historic family vacation, or the setting of your very own, romantic alpine getaway. Either way, it’s a win-win proposition! Aniesia Williams is an LA-based, yet global senior brand strategist and expert, multimedia journalist, and digital beast. She was recently named as one of Network Journalâ€™s Top 40 Under 40. She brings more than a decade of experience in marketing, new media, and branding. She has provided her expertise to some of the worldâ€™s largest brands, including Ford, Samsung, Shell, Lionsgate, and the Clinton Global Initiative. 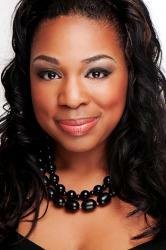 As a journalist, Aniesia also writes extensively about business and luxury travel experiences. Beyond her own media platform, A Global Lifestyle, Aniesia has provided content for top publications, including Business Insider, Black Enterprise, and Ebony Magazine to name a few.